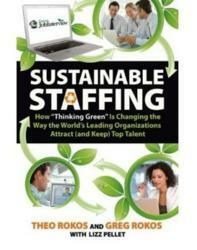 In their new book, "Sustainable Staffing: How 'Thinking Green' is Changing the Way the World's Leading Organizations Attract (and Keep) Top Talent," brothers Theo and Greg Rokos and a team of thought leaders deliver a primer on smart tools and best practices to re-engineer Human Resources for sustainability—paving the way for widespread organizational change. The Rokos, founders of GreenJobInterview and pioneers in teleconferencing for talent acquisition, highlight how one small but revolutionary idea—live virtual interviewing—helps save time, money and the planet. Ready or not, say the book's authors, green is the new black—and companies that intend to compete in the 21st century can and must find ways to create and develop more sustainable workplaces. How profitability and sustainability can co-exist. What defines the business case for sustainable HR solutions and how to get the C-suite involved. How Walmart saved $2 million in one year by moving to live virtual interviewing. How to leverage sustainability to attract, retain and develop employees. What the green movement means to Gen Y talent. Success stories from companies like Walmart, PepsiCo and University of California, Los Angeles (UCLA) which have implemented live virtual interviewing. "Fixing corporations is the fastest and most efficient way to implement more-sustainable models of living and working," says Theo Rokos. "And HR is the best way to change or implement policies across a company. If we can make hiring and HR processes more sustainable, we then have the model and the environment to change the whole organization." Theo Rokos is the CEO and co-founder of GreenJobInterview. He has built national and international sales organizations from the ground up for Global Fortune 5000 companies including the Royal Bank of Scotland. In 2011, Theo was named one of the top forty executives in Orange County under the age of forty by OC Metro. Greg Rokos is the president and co-founder of GreenJobInterview. With 20 years in the recruiting industry and founder of his own recruiting firm, he has been featured on NBC and CBS, and in Fast Company and HR Executive. He regularly presents at industry conferences and national talent acquisition meetings of Fortune 500 companies. Lizz Pellet is a thought leader in the HR space and the author of The Cultural Fit Factor: Creating an Employ¬ment Brand That Attracts, Retains, and Repels the Right Employees and Getting Your Shift Together: Making Sense of Organizational Culture & Change. She is a Johns Hopkins University fellow in change management and a professional educator, keynote speaker and facilitator.